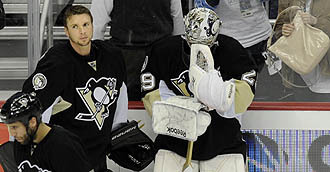 The curtain came crashing down on the Penguins’ 2010-2011 season Wednesday night, as they fell in the decisive game seven 1-0 to the Tampa Bay Lightning. It brings an end to a frustrating season for fans, as many were left wondering what could have been, as the team was the best in the league before losing star players Sidney Crosby and Evgeni Malkin for the season halfway through. The Pens had seen their three game to one lead in the series slip away, with the Lightning outplaying them in games five and six, setting up the final game in Pittsburgh. The last game was a microcosm of the series for the Penguins. They got great goaltending from Marc-Andre Fleury, who was the primary reason for the Penguins ability to stay in the game. However, the anemic offense, which many feared would the biggest obstacle for the team to get over, did them in. The Penguins went a ridiculously horrible 1-35 on the power play during the series. This just shows how much the team missed their playmakers Crosby and Malkin. Tampa Bay would only need one goal, which was scored by Sean Berginheim on a clone of a play behind the net that got the Bolts a tally in game six. Tampa goalie Dwayne Roloson increased his record in elimination games to 6-0, standing tall in net. With the high expectations this team has now, a first round exit would have been thought to be a colossal failure back in December. However, with all the adversity the team faced throughout the second half of the season, few if any teams would be able to keep it together losing as many players as they did let alone come within a few points of a division title. It gave us a chance to see the skills and heart that many of the team’s young prospects have while they stepped up in tough situations. Though many of the games weren’t pretty, you couldn’t help but admire the effort the team gave on a nightly basis. Certainly fans are disappointed that the season came to an early end, but with the Penguins healthy going into the 2011-2012, and the experience they gained during a turbulent season like this, they will be the team to beat in the NHL next season.